Revisited Myth #12: From the ancient Greeks to colonial America, the pineapple has long been a symbol of hospitality. The myth of the pineapple as a symbol of hospitality is a powerful one. You hear it in most historic houses, usually in a dining room or bedroom when the tour guide points to a pineapple table centerpiece or a pineapply-carved bedpost and explains that the pineapple was served to guests as an expression of hospitality because it was so rare. Rare it was indeed, and relatively expensive, coming all the way from the West Indian tropics to American ports—the pineapple would have been a treat on any early American table. But there is not a shred of evidence that anyone at the time thought of the fruit as a symbol of hospitality. That idea came much later, in fact, not until the early twentieth century. 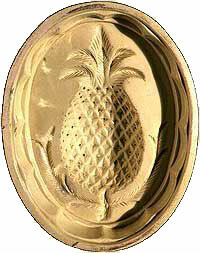 Yes, they did also use pineapple imagery sometimes–I’m thinking of the ceramic pineapple dishes at Colonial Williamsburg’s museums, for example, and the architectural elements at Shirley and Westover Plantations. But these were celebrations of the exotic fruit, not expressions of hospitality. Amateur historian Melvin Fulks, who has spent decades gathering information about the origins of pineapple/pinecone symbolism, says that the earliest incidence of the “pineapple as hospitality” story he has been able to find comes from a 1935 book about Hawaii. a Dole publication encouraging people to eat canned pineapple and visit lovely Hawaii. The pineapple myth simply refuses to die an honorable death. Unfortunately, it has spawned several children that are even more absurd than the parent. One blog reader reported: “I was told by the tour guide at . . . that the pineapple in the bedroom was a subtle suggestion that the guest was no longer welcome. Perhaps a parting gift?” A tour guide wrote that a visitor told her that when a homeowner got tired of his overnight guest, he would leave a pineapple on the guest’s bed as an unspoken message to move on. Yet another said that returning sea captains would stick a pineapple on the fencepost or set it on the front porch to let neighbors know he was home and ready for hospitality. What nonsense! I’m sure there are more. For an excellent, exhaustive, and I think definitive article about the pineapple, you can’t beat Michael Olmert’s “The Hospitable Pineapple” in the Winter 1997-1998 issue of the Colonial Williamsburg Journal which, sadly, is not available online. You can always write to Colonial Williamsburg for a back issue. Professor Olmert teaches at the University of Maryland and one of his specialties is the 17th and 18th centuries. Bingo–it is the gift shops sales clerks and other salespeople who perpetuate this myth for the boost it gives to the sale of pineapple-themed merchandise. And frankly, today it is true! After almost a century of repetition, the pineapple has come to symbolize hospitality. However, no one has yet been able to point to an example of that association in the 17th, 18th, or 19th centuries. This entry was posted on Thursday, April 17th, 2014 at 9:22 am and is filed under Architectural Features, Food & Beverages, Furniture and Furnishings. You can follow any responses to this entry through the RSS 2.0 feed. You can leave a response, or trackback from your own site. 14 Responses to Revisited Myth #12: From the ancient Greeks to colonial America, the pineapple has long been a symbol of hospitality. Great article. One thought, you might want to mention the actual name of the pamphlet that Fuld mentions. I think people need to see this is a specific example of the Hawaiian canning companies marketing strategy for promoting Hawaiian pineapple. The history professor I corresponded with mentioned he was aware of this pamphlet and an earlier one in the early 1920’s. I came across this article that provides citations to the origin of the story. Its all very interesting – especially the bed post. The first account of the pineapple was given by Christopher Columbus and his men, who landed on the island now known as Guadeloupe on their second voyage of discovery.1 Columbus brought the succulent fruit back to Europe in 1493. Its cylindrical shape and rough, spiky surface caused the Spaniards to name it pina, after the pine cone, although the pineapple is much larger by comparison. The English noted the same resemblance, hence our word “pineapple”. The Portuguese, along with other Europeans, took their cue from the Carib appellation, nana, and called it ananaz. During early Colonial days in the United States, families would set a fresh pineapple in the center of the table as a colorful centerpiece of the festive meal, especially when visitors joined them in celebration. This symbolized the utmost in welcome and hospitality to the visitor, and the fruit would be served as a special desert after the meal. Often when the visitor spent the night, he was given the bedroom which had the pineapples carved on the bedposts or headboard–even if the bedroom belonged to the head of the household. A small, peaceful hamlet in rural Alabama boasts symbols of the pineapple everywhere your eyes may look. Pine Apple, settled by “Easterners” from the Carolinas, Georgia, and Virginia around 1820 was originally named “Friendship”. But there was already another Friendship, Alabama, so the settlers named their town in honor of the pine and the apple trees that gave the land its beauty and the town its wealth. These days the town’s name is as often written “Pineapple” and it is Pine Apple. Signs of this universal symbol of hospitality are seen painted on the front doors of homes and the town’s welcome sign, carved in fanciful finials and Christmas decorations, atop gate-posts and roof-tops, carved into bedposts and head-boards, and found in a variety of table centerpieces.5 Other carved items found around southern homes include serving trays and wooden bowls. Not only have wood-carvers etched this immortal symbol, but the delicate hands of needle-workers have preserved this symbol in family heirlooms over the centuries. Items such as pineapple samplers, table cloths, and crochet doilies are but a few of the items found in homes of unbounding welcome. Modern decorative items include pot holders, towels, small framed accents, drink coasters, decorative flags, brass door knockers, curtain finials, stair-rail and mailbox posts, and welcome mats. The pineapple has been a universal symbol of hospitality and welcome for many centuries all over the world. 1. Andre L. Simon & Robin Howe, Dictionary of Gastronomy, The Overlook Press, Woodstock, NY, 1970, p. (unnumbered). 2. L. Patrick Coyle, The World Encyclopedia of Food, Facts On File, Inc., New York, NY, 1982, p. 517. 3. Maguelonne Toussaint-Samat, A History of Food, Blackwell Publishers, Cambridge, MA, 1992, p. 677. 4. Darla J. Fanton, “Old Fashioned Welcome Collection,” Cross Stitch Plus, Sept. 1992, Vol. 9, No. 5, House of White Birches, publishers, Berne, IN, pp. 21-25. 5. Emyl Jenkins, Southern Hospitality, Crown Publishers, Inc., New York, NY, 1994, pp. 18-21, 116. It was written by Beverly L. Pack and I believe this might be her pictured below. The door in the website looks to be circa 18th century with the pineapple carved over the doorway. Sorry, we can’t see these pictures. However, I know of some examples of 18th- and 19th-century carvings that include pineapples and pinecones, but they weren’t considered AT THAT TIME to be symbols of hospitality. We think that today; they didn’t think it back then. I find it interesting that all these sources are based in the 1990’s when much of this myth was expanded. I find it disturbing that the authors of the primary sources have not looked at canned pineapple marketing during the 1920’s – 30’s. Everything else is so contrived and neatly packaged that it reads like the introductory Hospitality Management texts that the American Hotel and Lodging Association’s Education Foundation promotes for hospitality management courses. I’m afraid these aren’t primary sources, they are secondary sources repeating myths they’ve assumed are fact. The tip off is the sentence about the Caribs considering pineapples a symbol of hospitality. Really? According to whom? Did some Spanish-speaking Carib Indian tell Columbus that and then Columbus wrote about it in his log? There is no documentation for that. As for #5, Emyl Jenkins was a dear friend and mentor, and much as I loved her, she was not a historian; she happily repeated myths like this in her book on decorating, just as she repeated the myth about firescreens in one of her other books. The dictionaries are fine sources, but #4 is not–it is a book about sewing and the author has thrown in a few myths she’s heard. If anyone has any primary documentation that would support the pineapple myth, I haven’t seen it, nor have the historians in the Research Department at Colonial Williamsburg. These books are good examples of how myths spread. As Kerry mentioned, the sources are 1990’s. As with any modern sources, comes modern citations at first blush. After reading the citations, additional citations are found in the mid 1800’s. It becomes evident that the pineapple was viewed as a welcome when the town of friendship incorporated in the mid1800’s while discovering another town in AL with the same name – Friendship. The towns people were forced to pick another name as welcoming as the first and decided on the name of Pineapple, AL. Perhaps the meaning of pineapple is much like a hand shake and as self evident as Pineapple, AL. With modern times giving way for modern citations to the meaning, a hand shake is understood by the symbol itself with little to no citations to is origin. I know that after more than a decade of research to the period of the American Revolution, I have read about the well received pineapple from arriving ship captains. It was a rare and valuable delicacy that would have been shared among the best of friends. There would be no wonder why its image would be so welcoming in our past. I am sure you’ve read about pineapples being imported into the colonies from the West Indies in your research. I am also sure they were much appreciated. So were the other tropical fruits, limes and lemons and oranges, for example. And sharing these would be lovely. But nothing in that supports the idea that anyone in that time considered the pineapple a symbol of hospitality and more than the lemon or line. I do know that some of the locals have peach trees and the population is probably less than 200 and that apples were not common until they were introduced most heavily in the south during the Great Depression. The precise naming of the town of Pine Apple was at the very same time the town was at the very last stop along the building of the Selma to Pensacola Railroad and when the town would most importantly wish to be viewed as hospitable for its commercial growth. Perhaps this might answer the question. The pineapple was also considered to be different and unlike all the other fruits in that it was frequently labeled as a passion fruit. When Christopher Columbus arrived in the West Indian island of Guadeloupe on November 4, 1493, the pineapple was prized by the local natives who indicated welcome to friends by hanging pineapples above their dwelling places and the welcoming tradition continued into colonial America. It was rare, expensive and a delicacy when first introduced and you can only believe that the offering of this high demanding fruit would be an incredible act of hospitality to a guest of the 1700’s. Most apparent, the pineapple motifs were carved into bedposts or headboards in the rooms given to overnight guests during the 1700’s as architects and craftsmen adopted the motif in the 1800s, carving wood and molded mortar pineapples everywhere a guest of a residence would see it – at gate posts, entry doors, window frames, shutters and stair risers. In the dining room and upon entering a guest room, the design was stenciled or painted on walls, floors, and on the ceilings of a guest room in the 1800’s. 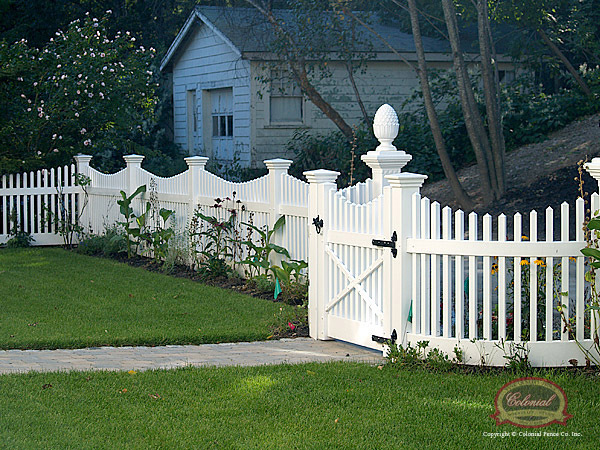 In all, the prominent design followed the path of a guest. The Shirley Plantation in Virginia dates back to the 1600’s and there is documentation that the owner speared a pineapple in front of the home to let friends know they were back from the Caribbean and ready to welcome guest as a sign of hospitality. A very large pineapple motif is now at the peak of its roof from the 1770’s. 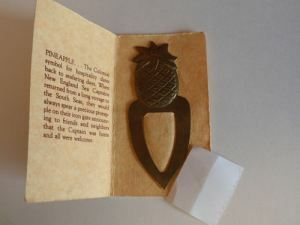 I looked at the publication – The Pineapple Culture – a history of the tropical and temperate zones to find that marketing robbed the pineapples wealth and hospitality symbol to one of, “Pineapple tendered the comforts of sun kissed lands and the sweet scent of Paradise,” by the Dole Hawaiian Company. The questioning of hospitality opens the door to many questions – why did the colonial people value it in their designs more than all the other fruits? Why did they carve it into the entrance of the dining room up high like mistletoe and where quest might stay? Why was this image used as a symbol at the front door of a home and at the front door to be displayed by arriving ship captains? What was this symbolic meaning over all the other fruits and what made it so special over all the others of this early period? How did it become the crowning fruit that was used in architecture of the 1700’s where guest were most prominent? Did it have some kind of special meaning that is not attributed to other fruits? I believe these questions of the 1600’s and 1700’s need to be answered before we disprove hospitality. Without an answer to hospitality, we are left with numerous questions to the use of the image of the pineapple in architecture during the 1700’s surrounding areas where guest are most prominent (entrance, dining room entrance, guest room), and a growing image in the 1800’s or perhaps we find ourselves with no answer at all for this frequently used symbol. Unlike any other fruit, it has been an image that has been displayed as a symbol in America. Without an answer to its symbolic prominence to guest locations of the 1700’s, I think its fair to say that without an answer it would be difficult to erase what has been passed down from the past. My view on this – it was a sign of hospitality from the natives of the West Indies and carried over to the culture of the American people during the 1700’s as it was centered on friendships while entertaining friends who traveled at great distances with many stories to be told. The American colonist took good care of their guest at their dining tables and firesides. They rode out the winters together while each person was dependent on the other for survival while frequently staying at each others home or exchanging a horse for a fresh horse for travel. I believe what sometimes became a well known centerpiece at the dining room table became a recognized symbol of hospitality to the best of friends that ended with a most enjoyable and very expensive dessert. Mary is correct on this matter Mr. Cummings. There is simply NO written evidence at the time that the pineapple was viewed as being a symbol of hospitality until the strategy of disseminating marketing literature of canned pineapple, and in particular canned Hawaiian pineapple from the Territory of Hawaii in the early 20th century. That’s when the first association connecting the pineapple and hospitality is made. One primary source is Isabel N. Young, A.M. “The Hawaiian Isalands and The Story of Pineapple,” American Can Company, 1935. In further correspondence with Dr. Hawkins, he stated his opinion that, “With regard to Hawaii the advertisement I use as an illustration in my book is the first one I am aware of to indirectly link pineapple to Hawaii as a visitor attraction. I suspect the pineapple was not used as a symbol of hospitality and welcome in Hawaii before annexation. The pineapple is not indigenous to Hawaii and until the late 19th century was not grown commercially in the islands. ” (private correspondence Feb 3, 2014). The previous quote from him occurred Jan 31, 2014. This topic of keen interest to me as many hospitality management departments utilize introductory textbooks from the American Hospitality & Lodging Association Educational Foundation that perpetuate the myth. The other major sources of canned pineapple during the early 20th century came from Jamaica and British Colonial Malaya (today’s Malaysia). I have been trying to research marketing and advertising literature from these two other product sources of pineapple that was being imported into the United States. Call it a “Pineapple War,” but I suspect that the myth largely began from the early 20th century as these canned pineapple manufacturers were trying to gain a foothold and market share in the US market.